I’ve been having a lot of trouble keeping track of everything I need to do in order to keep my life from falling apart. I mean, I have no idea when I did laundry last, I think it’s been over a month since I’ve vacuumed my room (and my allergies are starting to show it), and I’m sort of blundering about the “learning how to use my new computer” process without any sort of plan. I’m usually very good at these things. I’m a list-maker. I have systems so that things don’t go unnoticed or forgotten and my lists stay useful and up-to-date. Mostly that system follows the Getting Things Done philosophy (GTD for short). The problem with my system right now is that my interface is gone. All of my lists – not only their content, but their organization – were on my iPod. Which was stolen. I know I keep bringing up the theft thing, but seriously, with all the things that were taken my life came to a screeching halt and it will be quite some time before everything is back to normal. Sadly, this is not the first time this (the list system failure, not the theft) has happened. When I first started using GTD I was low-tech and managed it by manually typing out lists on the computer and printing them out to stick in my planner (I still get catalogs from DayTimer…at first it was funny, now it’s just sad.) The printing process quickly became tedious and wasteful though so I slowly started migrating everything to the computer. I used OneNote to organize my lists at that point. There were lots of internal links to other pages for project notes and what not, and it was a little complicated to set up, but it worked pretty smoothly once it was. As long as I kept up with it, that is. If things started to get out of date and links weren’t updated properly it would quickly spiral out of control and I would have a godawful mess to untangle before the lists would be remotely functional again. See, the brilliant thing about GTD is that if you do it well then you will have a detailed to-do list for EVERYTHING you could possibly want/need to do at any given moment, but only have to look at a small portion of that list based on whatever was actually feasible for you to do at the time. That way you wouldn’t have to remember anything, EVER. You’d just look at a list and get to it. The problem with GTD is that if you do it well, you have a massive amount of things in those lists, and if you do it REALLY well, once those things are on the lists, they exit your brain. So, when my computer had a problem and needed to be restored to a previous backup, erasing at least a month of changes to my lists, the whole system collapsed. The lists were polluted with things that were already completed, nothing that I had added to the lists were there and I had a hard time remembering what all was supposed to be there, all of the links to other pages were messed up and out of date, and IT WAS AWFUL. To make matters worse, somehow in the restore process the folder organization I had been working on for all of my documents and pictures and such during the missing month were fine. They didn’t get wiped out at all. The problem is, the OLD mess of folders that I had had BEFORE I organized them all got restored on top of the new organization in a weird tangled mess. I had duplicates everywhere and it would be quite a lot of time and effort before I could track them all down and sort out the proper organization again. I still don’t understand how this happened. 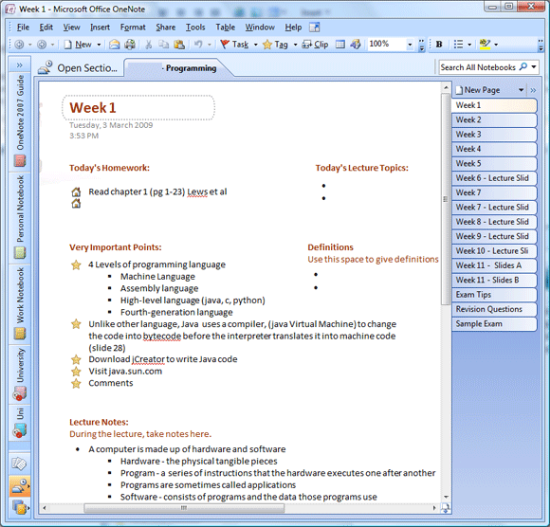 At that point I sort of gave up on the whole OneNote organization and started fresh with Next Action! on my BlackBerry. I really wanted something more mobile anyway. For a while it was perfect! All of my lists were nice and tidy and with me at all times. I was a bit nervous about what I would do if my BlackBerry went belly up since I really didn’t trust that the backups you do on those things would actually back up any of the list contents – especially after seeing how well the backups on my computer had gone. As I fleshed out the lists more and more though I started to have problems navigating through them. One important component of the GTD system is being able to review your lists regularly and with the length of some of these lists I was really having trouble getting through it all on that tiny screen with half of the names cut off. For many of the actions I would have to click on each item individually in order to see the full text and know what in god’s names I was supposed to do. As time went on and more things were added I noticed a new problem – there seemed to be a limit to how many things you could have on the lists and still have the program function efficiently. To be fair, I’m a bit taxing on these lists. I keep track of a lot of stuff. 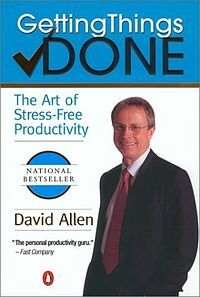 On page 41 of the book David Allen writes that most people are likely to have fifty to 150 actionable items on their to-do lists at any given time. I laughed so hard at that, and still do every time I think about it! Who ARE these people who lead such uncomplicated lives?! Seriously, at any given time I’m likely to have HUNDREDS of actionable items. I mean just the chores alone could top 100 actionable tasks I could be doing right now. So the fact that the program was starting to slow down under the weight of my own ambition wasn’t surprising, but it was disappointing. I started to ease off on the list managing and stopped keeping track of certain categories of things, like my crafting. It made me uncomfortable, but at least I was less likely to forget what needed to be done craft-wise out of apathy. The slickest app I’ve used yet! RIP iPod. I had two wonderful months with that program before it was ripped away from me. 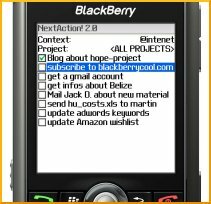 It wasn’t enough time to fully test out whether the system could withstand the sheer volume of tasks I wanted to throw at it, but at that point it functioned so much better than anything I could ever get on the BlackBerry I didn’t care. If I really needed to I could probably set up a separate list on the computer for the crafting so I didn’t tax the iPod too much. I also hadn’t had time to check out Toodledo and learn their system AT ALL. I was too distracted by the shiny new iPod. Everything I had in the Action Lists program is safely backed up on my Toodledo account, I checked. However, at first glance their set-up is confusing and I really didn’t want to spend hours in my sister’s never-been-dusted-or-vacuumed-death-trap bedroom on her slower-than-molasses-and-buggier-than-the-Amazon computer figuring it out. Also, it felt too much like the OneNote fiasco all over again and I Just. Couldn’t. Handle. It. With this list in mind I started to do some research to find a suitable successor to Action Lists. So far I’ve come up with a few possibilities. I’ve heard of it before, and only heard good things about it until I started looking at reviews for 2Do comparing it to OmniFocus. 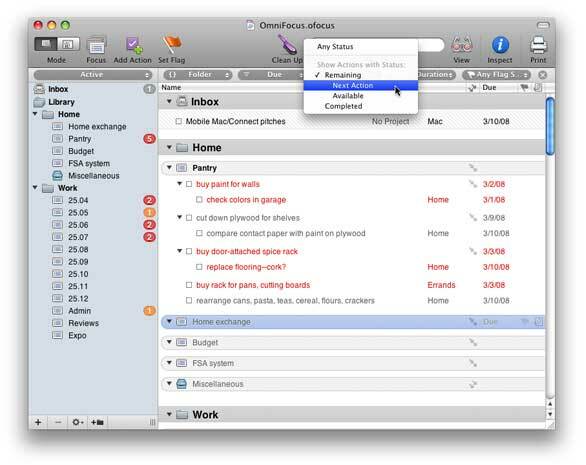 Has ability to attach tasks to projects, and have tasks with due dates. 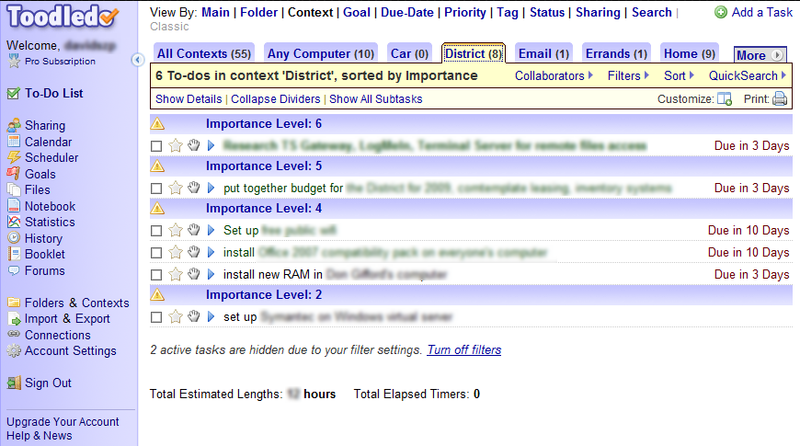 Can sort tasks into contexts. Offers a 14 day trial – though I’m not sure that’s enough time for me to properly vet it. It won’t sync with Toodledo and I didn’t find any other info on how to back up the system. There may be a way, but it wasn’t obviously advertised. Some people complain that the program is too “bloated” to be efficient. Interface may be overly complicated. Some complain that there is a serious learning curve, and considering there are set-up guides and books on the subject, I believe it. 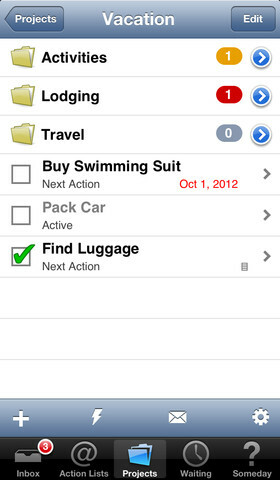 Syncs with Toodledo, so all of my previous lists will be saved! Also future lists will be backed up safely online. 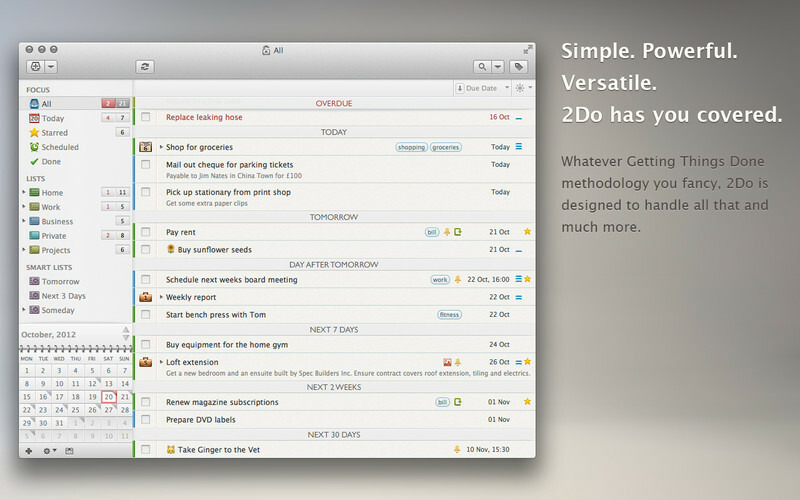 There is a way to organize tasks into projects, but it looks a bit clunky. Aaaaand that’s as far as I got before my brain started to shut down. 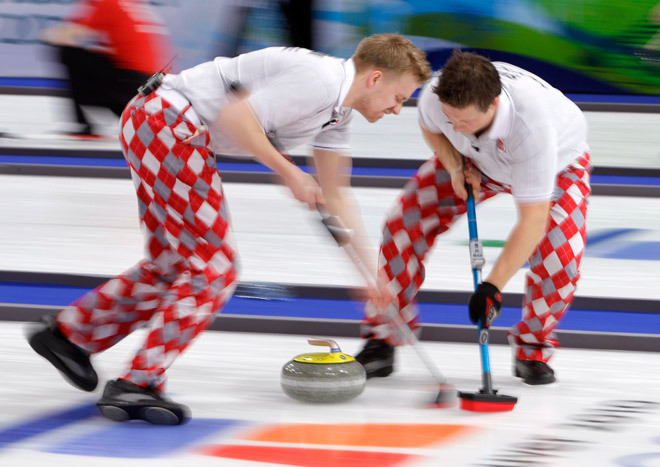 I turned the TV on to watch some curling and fell asleep to sounds of rapid ice-sweeping and dudes screaming “HARD! HARDER! !” in delightful Canadian accents. Seriously, it’s the funniest sport ever. My brain can’t do this anymore, HALP! A small, easily forgotten library of stories all by one author, punctuated by the charming howls of the librarians who are getting ever closer to finding your hiding spot. Express your Concupiscence with Style!